The Frenchman Adrien Renaudin has just experienced a historic success on a Sodi chassis from the CPB Sport team. In recent years, Sodi has shone at the highest level of international competition with the drivers of the factory team in the KZ category, but this is the first time that the European Championship in KZ2 has rewarded the French brand.
. The demonstration of the quality of Sodi products is all the more convincing because it is the work of a young driver from a satellite team. Noticed for his incredible victory in the last event of the European KZ2 Championship in 2017 in the rain at Kristianstad (SWE), Adrien Renaudin became the best French hopeful in this category. 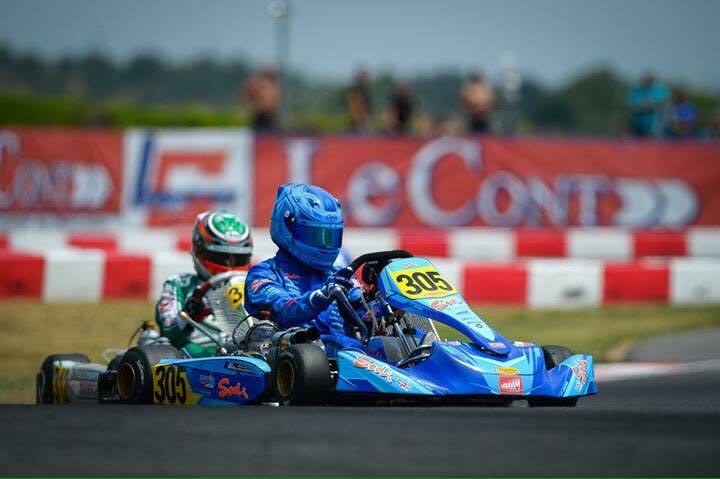 A driver trained in France in Rotax Max with Sodi, he did not take long to climb the international ladder while remaining faithful to the world's leading karting manufacturer. This year, the CIK-FIA European KZ2 Championship gave him the opportunity to shine at the first event at Salbris (FRA) taking the lead after winning magnificently in the Final. However, the game was far from won, as the second race was held in Italy, at the circuit of Lonato, in the presence of competition more formidable than ever. Credited the 4th time of his group in Qualifying, Adrien took 10th position of the 78 participants and regained three places in the heats, thanks to a victory. He then adopted a well-calculated strategy for winning the title in the Final and oversaw the positions of his rivals without taking unnecessary risks. His 9th position at the finish of a relatively cautious race allowed him to score enough points to be crowned without a hitch in the countback from 46 to 37. This tremendous success is also to the credit of the CPB Sport team, partner of Sodikart since 2015, specialising in international racing in KZ2. In direct collaboration with the factory, Paul Bizalion’s team is an exceptional success that attracts many French and foreign drivers under the colours of Sodi. CPB Sport has paved the way for Sodi's well-deserved international acclaim of its chassis with multiple teams. "I want to congratulate the driver and his team for this great European result," said Bertrand Pignolet, Director of Sodikart. "This is an important reward for all the staff of our company. We have chosen to limit the Sodi Racing Team to the elite categories to give the opportunity to private teams to shine in categories such as KZ2. With this European Championship, we won our bet while demonstrating that our standard production is competitive at the highest level. "